Rediff.com » News » Is the Modi government scared of this man? Tribal rights activist Gladson Dungdung was offloaded from an Air India flight to London on Monday, May 9. In a Facebook post, the activist wrote that this was not the first time this had happened to him. In 2013 his passport had been impounded. Dungdung is the author of the recently published book, Mission Saranda: A War for Natural Resources in India in which he outlines the plight of tribals in Jharkhand's mineral-rich Saranda forest. The book, he says, highlighted the government's anti-people industrialisation policies. Dungdung spoke to Syed Firdaus Ashraf/Rediff.com. This is the second time you have been detained at an airport and deplaned. Why? It is clear. For the last one decade, I have been raising the fundamental question about Adivasi rights. The Indian State intends to clean this corridor and hand it over to corporate czars. This is what I have written in my latest book, Mission Saranda: A War for Natural Resources in India. I have proved in the book that this war is not to clean the area of Maoists, but under the guise of flushing out Maoists, the State is intent on waging war on the Adivasis to grab national resources. I have been speaking about this for many years. When Prime Minister Narendra Modi went to the United Kingdom he was asked a question about this (Adivasis and the environment). We are raising these questions globally. People are also questioning investors by telling them that it is because of their money that the Adivasis are getting killed. Many investors withdrew from the Arcelor Mittal project in Jharkhand. Therefore, the Government of India is targeting activists who are going abroad and raising these questions in international fora or the United Nations. Why were you going to London? I was going for an international conference, Environment Politics of South Asia. I was to speak about the Saranda forest and how we will lose this forest because of the mining companies. At present, 22 new mining leases have been given and I have been highlighting this issue. At the same time, Adivasis are not being given rights under the Forest Act. The State does not like to hear uncomfortable questions and that is the main issue. You said Vijay Mallya was allowed to leave the country, but an activist like you were detained. Of course and this is not surprising. Despite Mallya being a huge defaulter of bank loans, he was allowed to leave. Therefore, I said defaulters like Mallya can't be offloaded, but activists like me are. And that too for raising questions. All I am saying is enforce the Indian Constitution and the law of the land, which they (the Centre) are not doing. They are only talking about business, business and business. This business is not only a threat to Adivasis, but also to our ecology. You see, we have 12 per cent forest left in India. India's government commitment is to maintain at least 33 per cent coverage in India. In 2011, the Government of India came out with a forest survey report which said that the forests are the only place where Adivasis live. So imagine what will happen if Adivais are not there. There will be no forests. What next? So the economy must go with ecology. I say if you sell everything for money, what will happen next? We are not thinking of oxygen. See what is happening in Tokyo. They have oxygen cafes. Now, a Canadian company is ready to sell oxygen in India and that is why I am concerned. When we talk about economic growth without ecology we cannot grow. We are making a hell of this country. Can't you talk to the government and work together rather than just criticise it? We are talking to the government. 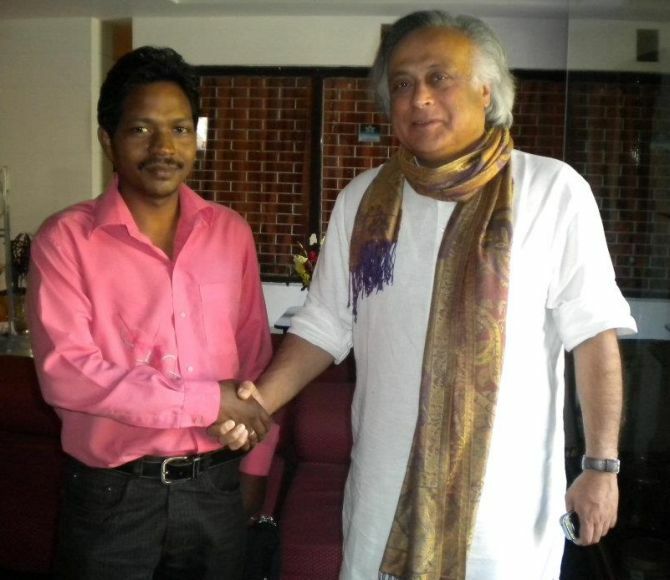 I met Jairam Ramesh, the environment minister of the UPA (United Progressive Alliance) government. He said he would not allow private mining companies in the Saranda forest. He did not allow it. Later on, Jayanthi Natarajan replaced him and she allowed Jindal and two other companies in the Saranda forest. I am always ready to talk with the government, but this government is not ready to engage with decent voices. How will you talk to this government? What is the position in the Saranda forest with regards to mining? The last government gave 22 new mining leases. Now they are trying to give more mining leases. Environment Minister Prakash Javdekar says he is trying to make it easy to do business. Earlier, it used to take 560 days for forest and environment clearances for any project. Now, they have brought it down to 190 days and now he is saying he will bring it to 100 days. I am surprised how a minister who is supposed to protect the forests and the environment is happy reaching out to investors for more and more clearances. It is surprising what is happening to India. But we need jobs too. I do not agree with this. Only few jobs are created. Take the example of Tata Steel. When Tata Steel was producing up to 1 million tonnes per annum, 70,000 people were employed. Now what is the situation? 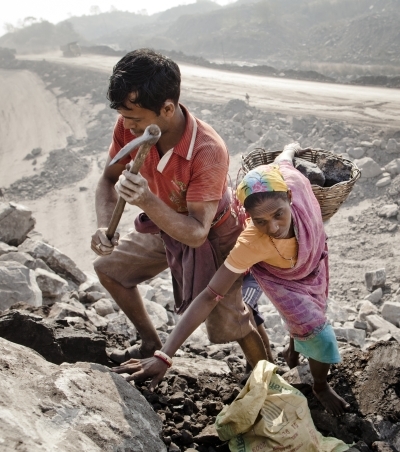 In 2009-2010 they started producing 8 million tonnes, then how many people must be employed? More than 500,000 right? No, they had only 20,000 people. Employees were reduced. So where are the jobs? But that is because of automation. There are other kind of jobs too. If Tata Steel employs 20,000 people, then other jobs get created on the periphery. You read the book by Dr Ashish Kothari and Dr Aseem Srivastava (Churning The Earth) on jobs in mining companies. You will understand the situation. We are not focussing on the agriculture sector. In 1950, the contribution of the agricultural sector (to the national economy) was 51 per cent. Today it has come down to 18 per cent. Today, we are focussing more on mining, industry and services. The service sector is fine, but mining and industry do not really care about climate change and deforestation. For money, we cannot sell all our forests and trees. We have to find other ways. IMAGE: The Birhor Adivasi are the last remaining tribal group in Jharkhand who still attempt to live a hunting/ trapping/gathering life as they have for thousands of years. But due to the pressures of mining and logging, the habitat for wild animals is rapidly disappearing along with the Birhor's way of life which depended on plants and animals. Most have given up their formerly nomadic life to live in concrete government resettlement camps. Here, a Birhor couple have returned to their resettlement camp from an unsuccessful hunt with their traditional nets. On the wall behind them can be seen graffitied images of coal trucks, the new reality they are facing. Don't you think Adivasis too need development? That is where India fails to understand and globally too, people fail to understand, what development means. Development does not mean taking people out of the forest. You want to run away from nature in the name of development. We are running away from nature and therefore climate change is affecting the world. Development means we need to live with nature. Everybody should go back to nature. Nobody opposes development. Everybody needs education, food, electricity and roads. You provide that and who is objecting to that? Today what is the meaning of development? Take over land, water and forest from the Adivasis and hand it over to corporates. I do not agree with this view. We are losing everything in the name of development and that too for only one per cent of the population. Only 1 per cent of the population holds 99 per cent of the resources of this country. Is this development? The Indian Constitution guarantees economic and social justice to everyone. When will equality come? Government policies are creating more and more disparity. The money coming from mining companies is not going back to the people, but going to Jindal and other industrialists. Take the example of Jharkhand. Each year, there is an income of Rs 15,000 crore (Rs 150 billion) from mining alone, which is almost equal to the annual budget of Jharkhand. Check the below poverty line figures of the state. Around 46 per cent of the people still live below the poverty line. Why? If so much money is coming (from mining), why are people living in poverty? Who is supposed to respond to this question? The Indian State needs to respond. One charge against you is that when you go abroad you bring disrepute to India's development agenda. In the name of development, the Indian State is taking resources from poor people and handing it over to the rich. That is a fact. They are not concerned about people living below the poverty line. All these government schools have become khichdi serving centres. Only Adivasis and Dalit students study there. The rich people send their children to private schools. How will equality ever be attained? The State is working against the Constitution. The ruling elites do not realise this and they must. Today or tomorrow, they have to realise there is no other way and they cannot run away. The Constitution guarantees everyone the Right to Life, Freedom, Liberty and Equality, therefore the State cannot wither away. What is the status of your passport? My passport has been seized by the immigration officer. The local passport office authority says there was no question of impounding the passpoprt. They said earlier it was impounded but everything is clear and there is no need to impound it again. I feel there is mischief from the ministry of home affairs. They do not want me travel out of India. When you were not allowed to board the flight, what did you do? I narrated the whole story of my passport being impounded in 2013. At that time, they told me that there was an adverse police report against me. They said that after my passport was impounded in 2013 it was not cleared and hence, they are impounding it again. This is not true because I had surrendered my passport and got my passport in 2014. I had gone to Denmark then. I went to London twice in 2014 and 2015. I suspect the ministry of home affairs played a dubious role after my book was released. It was released in July 2015 at JNU (Jawaharlal Nehru University). What about the allegations that you are being funded by foreign NGOs to stop India's development? Also, that you are funded by church money. My travel was funded by the University of Sussex. It is a government fund and not a NGO. What is the difference between the Congress government and the Narendra Modi government as both governments detained and deplaned you? I don't see much difference. The economic policies are obviously the same. The Modi government is aggressively going for Hindutva whereas the Congress played with soft Hindutva. One difference was that during the UPA tenure, you could talk to them, you could share the table. In the Modi government, that space has gone. You cannot discuss and debate with the Modi government. They are not ready to listen. Our prime minister loves to address people through the radio but does not like to face a press conference. When the prime minister is not ready to face the media, how can you expect that he will speak to common people?